Nona …. I want to take this opportunity to thank any of your readers who voted for me in this election. I recognize the fact that I do not have any “direct” experience on any of SCA’s committees or volunteer programs but … I do bring to the board an extensive background in the management of facilities, construction, budgeting, finance and human resources – all of which are basic to the operations of the SCA. I promise to bring an element of “common sense” to the board and a diligent effort in exploring facts and conditions prior to voting on any subject. I personally have great hope that Gary’s significant management experience will be treated with respect as mine was not. Will Gary’s substantial restaurant experience be used for the benefit of the membership to protect SCA from giving away the store in negotiating with the probably pre-selected vendor? Or is Rex’s death grip on consolidating power so strong that his expertise will be rejected in favor of Tom Nissen and Forrest Quinn who have no restaurant or negotiation experience that is specifically on point as Gary’s is? 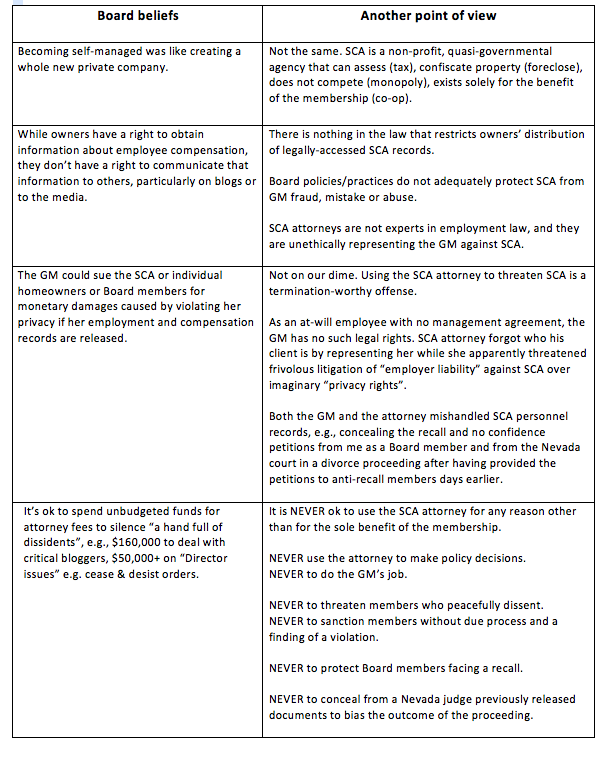 Rex Weddle and Bob Burch, in particular, proffered the pretext that my not having been on SCA committees was sufficient justification to refuse to treat as an equal member of the Board. Keep your eyes open, new directors! The new Board members need to guard against the incumbents claiming to possess special authority over them. Or that the Board is allowed to have secret meetings on topics other than the four permissible topics in NRS 116.31085 and SCA bylaws 3.15A. There is a surprising willingness for the GM and the attorney to play favorites and play fast and loose with the rules so that decisions that are supposed to be made by the Board in open session, informed by professional managerial and legal advice, somehow get made by who know who and who knows when. Be careful, it is very easy to get sucked in. Never heard about these charges? Voters probably didn’t hear about these open complaints because they were concealed. Unfairly, “on the advice of counsel” and on owners’ dime, the Board and the GM purposefully concealed complaints against them, and the attorney from the membership. They refused to place the complaints on an open Board meeting agenda as required by NRS 116.31187. 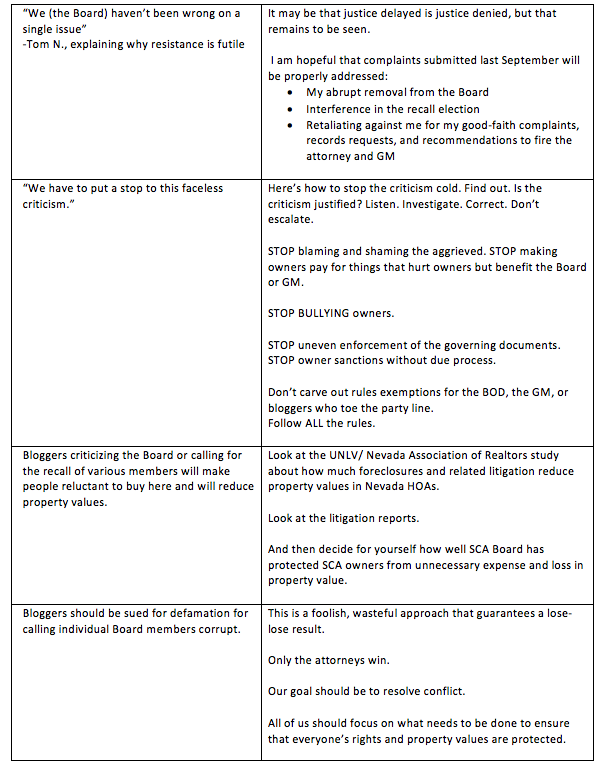 Board Policy Manual 6.1 was disregarded when they would not allow me, as an elected director, to discuss these violations in any open Board meeting. They would not fairly even allow the complaints to be investigated or be fairly debated executive session. When I tried to get the Board act lawfully, the Board’s official response was to kick me off the Board without notice or appeal. Good luck to the new people. In member comments, Board candidate, Gary Lee, pointed out some inadequacies in the reports. Of the 15 cases reported, 9 are foreclosures. Is there a problem with the way we are handling foreclosures? There are inconsistencies. Gary did not know what I’ll tell you below. In my case, that the defamatory and false statements were used as the pretext for kicking me off the Board and that the Board has refused my repeated requests to correct “errors” for a year. Clarkson Law Group has given the same false report for the last five quarters on the case that supposedly disqualified me from the Board. The current status of the quiet title case is not as of 2/1/17. That is the date when the original cross claim was filed, but dismissed on 5/25/17. This ignores that the claims of the Gordon B. Hansen Trust, by Nona Tobin, individual and trustee, were dismissed by Judge Kishner at a hearing on 5/25/17, and that the order (due in June 2017) was not filed by the SCA attorney until 9/20/17, a month after I was ambushed and kicked off the Board on 8/24/17 . The mere existence of this case is what Clarkson falsely claims disqualified me from serving on the Board. More importantly, what this lie has achieved is keeping my nose out of his debt collection business. The Lipson law firm’s report is defamatory. I was not removed from the Board “for cause”. This is a horrible, hurtful lie. It brands me “guilty!” without any finding of fact. It is a continuation of the harassment and retaliation I have been subjected to for over a year. I was unlawfully removed by the other six Board members in a secret meeting based on the totally false and unsubstantiated allegation that I was making a profit from my position on the Board. Poppycock. SCA was a named party in 2015 by the plaintiff Jimijack, who has possession of the house and been collecting rents on Bruce’s house since 2014. 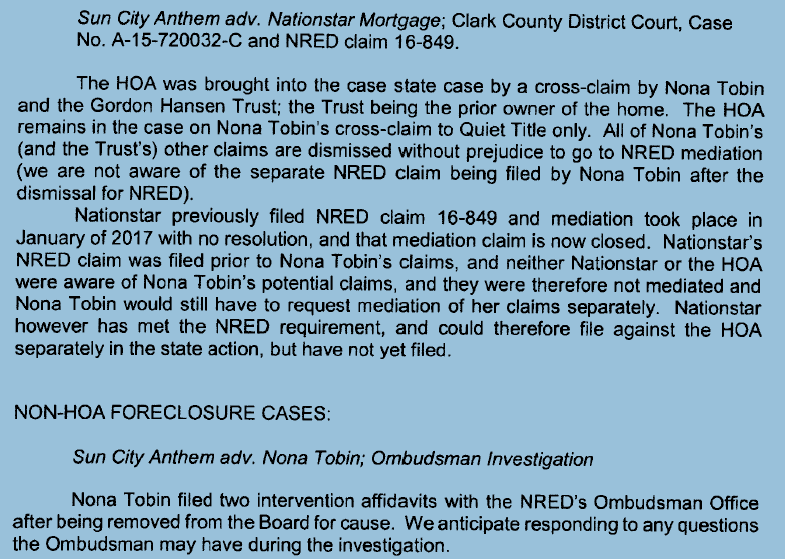 Nationstar filed a second lawsuit against the buyer at the foreclosure sale of 2763 White Sage Dr. in January, 2016 and completed a failed mediation with SCA a month before I showed up as the third lawsuit. On behalf of the Gordon B. Hansen Trust, I entered the case on 2/1/17 as a defendant in intervention on the two existing cases in order to regain the title for the trust. The 2/1/17 cross claim against SCA was to get SCA to void the defective foreclosure sale from which SCA’s former agents unlawfully kept $60,000 that should have been distributed to either Nationstar or the GBH Trust after paying SCA only $2,701. On 5/25/17, all claims against SCA were dismissed ($2,701 paid SCA in full in 2014 so SCA has no financial stake in the quiet title dispute), but the Lipson attorney did not file the 5//25/17 order until 9/20/17, a month after I was kicked off the Board on the pretext that the mere existence of this case disqualified me from being on the Board. I did not, and could not, make a profit from my position on the Board. My request to correct false reports was not heard. Click here to link to the request I intended to, but did not, bring to the Board. The tone of the meeting and the mood of the crowd made it clear that there was a zero% chance that the Board would see through their prejudices and willful ignorance to treat me fairly. There was a standing ovation for Jim Coleman who was shaken and outraged at being falsely accused of voting to kick me off the Board by lying, probably racist, Mr. (name redacted) blogger. There was zero acknowledgement that I existed in the room, let alone was deserving of compassion as the falsely accused (of making a profit off my Board position) and the actually-injured (kicked off the Board without a trial or finding of guilt) victim. Good question. The issue is way bigger than me. The precedent puts homeowners in all 3,000 HOAs in Nevada at risk of losing control over who sits on their Boards if who they elect can be “disappeared” without cause, a trial or an appeal on a pretext. I was kicked off the Board because the GM and the majority of the Board did not like me telling them they sub-standard in their implementation of self-management and that they were breaking lots of rules and needed to straighten up or I would tell on them. All the directors in any HOA would need to do to get rid of a Board member they don’t like would be to deem their position vacant by operation of law. It’s easy to kill a political opponent if you have attorneys willing to ignore all the other laws that exist to protect homeowners from arbitrary and capricious abrogation of their rights. This precedent is especially risky for the state because Adam Clarkson is the president-elect of the Community Association Institute and claims that his firm represents 300 HOAs, 10% of those in Nevada. The R-J just won a victory for transparency when the District Attorney was required to release information about how much the DA’s office was compensating witnesses in criminal trials. It should. 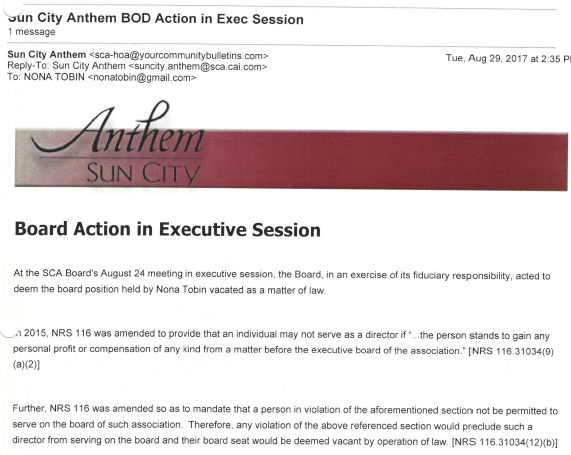 Sun City Anthem Board and GM are misusing the SCA attorney to hide their sins, and he is laughing all the way to the bank. SCA’s leaders are wasting owners’ money to hide information which should be easily accessible to us at virtually no cost on the website. SCA’s brand of mean-spirited opacity- hiding actions and expenditures from owners and making the owners pay the attorney fees for hiding what could even be unlawful or fraudulent – has more elements of sleaziness than I saw in the government’s efforts to avoid transparency. SCA has gone beyond the practice of merely blocking freedom of information requests as described in the R-J editorial to being outright abusive to owners who just ask for information they have a legal right to receive and distribute as they wish. For example, the claim on the new SCA Records Request Form that SCA records that might be requested, such as employee compensation, are “private and confidential records of the private entity that is the association” is simply false. 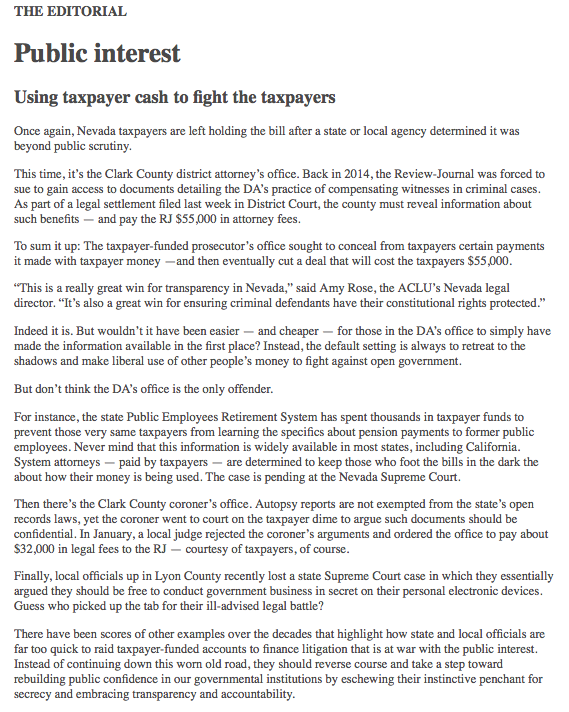 Those records can’t be confidential by Nevada law in Sun City Anthem and not confidential by that same Nevada law in Sun City Summerlin. I don’t see that the Public Employees Retirement System threatened the R-J with punitive sanctions for just submitting a Freedom of Information Request like our mean-spirited leaders are doing to SCA owners, threatening litigation for even asking for information the GM or individual Board members want to be publicly known. GM’s “privacy rights” bigger than owners’ rights? I also don’t see that the government officials ever claim that freedom of information requests violated some imaginary and legally-unsupported “personal privacy rights” as SCA’s attorney has done on behalf of the GM. Only withhold records from certain parties? I don’t see that the District Attorney claimed the requested information could be withheld from the R-J, but that it could be released to the R-J’s competitor? SCA has done this very thing repeatedly by providing information to OSCAR (recall opponents) that was withheld from others who were not in that camp. I also don’t see that the District Attorney just made up some bogus legal requirement that the R-J acknowledge that the information can’t be used in ways the DA would consider harassment or even just embarrassing. The new SCA information request form contains multiple ridiculous “acknowledgements” which have no basis in law. The SCA attorney is lying to owners about what owners’ rights are. Fines and other sanctions are threatened against SCA owners for requesting and disseminating information, both of which are within fully within owners’ legal rights. For example, the claim that SCA CC&R 3.6(h) and SCA Rules & Regs 9.4 would be violated and an owner subjected to penalties for violating any of the totally fabricated “duty, restriction and/or obligation provided herein” is a double whammy of threatening an owner for violating restrictions the attorney just made up out of thin air. 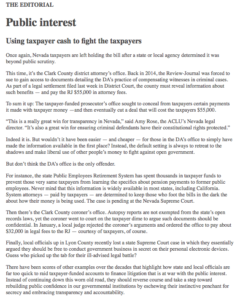 I also don’t see any egregious claim by Clark County that documents, actions or conversations become privileged just because the secretive official wishes that they were legally protected from public view as the Clarkson Law Group, the GM and individual members of the Board ludicrously and repeatedly do to unlawfully attack owners for exercising our legal rights. The burden of proof that documents, conversations or actions are legally privileged falls squarely on the party who is seeking protection from disclosure.